Making big changes (again) in my overall garden plan. This time it involves pulling back on my grand plan: to grow everything for everytime from everywhere…and concentrate on my own personal (lifestyle) pleasure. Call me foolish, call me old. In practical terms this means that I am pulling out the failed grape trellis (which was created after the failed grape arbor that was consumed, leaf by leaf by the Japanese Beetles and the Brown Marmorated Stink Bugs). All tolled, the horseshoe pit brought a whole lot more to my life than those high maintenance grape vines did. Of course nothing is simple in this life. Three of the four grape vines were stone cold dead, but one lived (we had a very cold winter last year). To trash that vine would be like drowning an unwanted kitten…I just couldn’t do it. 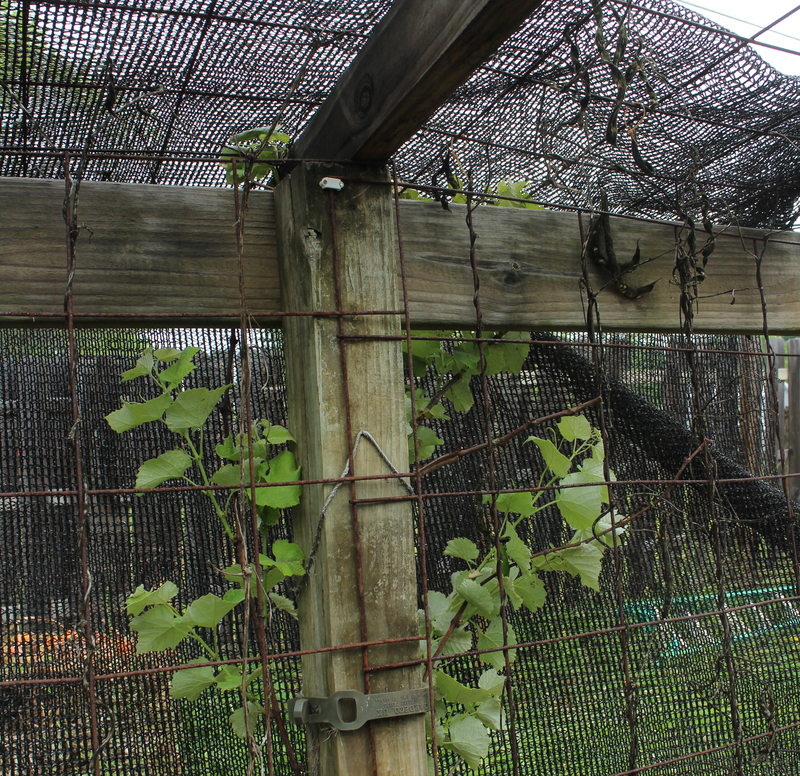 Despite the earlier failure (and because of the failure of the kiwi vines (see elsewhere) ) I decided to move the vine to the center rear post of the garden arbor, pretty much right where it had been 2-3 years ago. The first thing to do was to dig the “receiving” hole…preferably — as we read in books and catalogs — twice the size of the plant’s (anticipated) root ball. Then dig out the vine itself. Slogging through the high grass I’m thinking how ironic it would be to pick up a Lyme tick in one’s own backyard due to slothful yard-keeping. The vine itself came up easily (a clue, perhaps to why it was not doing so well in that location!) though removing all the tie-downs to its trellis was tedious, as was dragging the root ball, vine trailing behind, to its new location — delicately — to avoid losing too much soil, and to avoid spreading soil (and weed seed) on the paths. In the new hole I wanted only root and soil…none of the weeds and grasses that were in the grape row, now so overgrown. But pulling out all the stolons and rhizomes of the grasses left almost nothing surrounding the roots. No matter…there was no going back. A spadeful of well rotted goat manure mixed with what came from the hole and we’re done. Settle in, water down, mulch gently. Anchor the plant so that it will not be moved when the wind blows: that will constantly disturb the tiny feeder roots that the vine is sending out. If it has leafed out (like this one) then also find a way to provide some protection against sun and wind, at least for a week or two, so it can get itself back in balance. When you prune the roots of a plant (inevitable when digging) you change the balance between “root and shoot” which is to say above and below the crown of the plant. The plant senses this in a very real way and will respond as it must. If you have left it too little root to draw moisture for its leaves, it will drop the leaves it can’t support; if the leaves it has, when exposed to sun and wind, draw more moisture than the roots can supply, it will wilt and the leaves will die that way. But the plant will come back to balance (or die). But you can help in this process. In the case of my vine, I fastened it securely to the arbor using the decade old elastic cable ties from the Channel Tunnel between France and the UK (we sold thousands of them in the old Cooks Garden catalog and I took a pile with me when I left). Then after a good mulching and watering, I fastened a piece of shade cloth over the top of the vine (leafed out) to cut down on both sun and wind. Give it a week…the weather is supposed to moderate after today (cooler) and I’ll guess I can take the shade off in a week.